come over for breakfast won’t you? Coree adds to this: “I haven’t taken the time or made the investment in powdered culture (though I’ve meant to ever since Robin told me about it), I have improved the results of my homemade yogurt GRRReatly by simply boiling water in my milk-warming pan, then pouring it into my clean yogurt jars before I start the rest of the process. I’m pretty sure that it doesn’t take much “off-type” bacteria to interfere with the process, and using the same jars over and over again, or using them still damp from washing with water that isn’t boiling hot (like usual) can guarantee a build up of some kind of undesirable life forms. 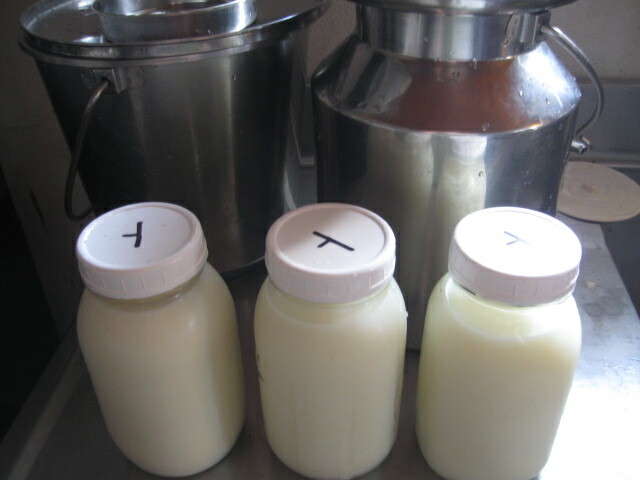 The boiling water cleans the pan the milk will be warmed in, then the jars before they set with the culturing milk. That’s my two cents. Back when I had a cow, I just used a little store bought plain yogurt to start my first batch, and kept the jar on the cool end of the warming shelf of my wood cook stove. Then I used the yogurt I had to start the next batch. I always had great yogurt.